Phoenix stood pat at No. 1 overall, winning the right to add either DeAndre Ayton or Luka Doncic alongside Devin Booker. The Kings finally found Lottery luck, jumping into the No. 2 selection. 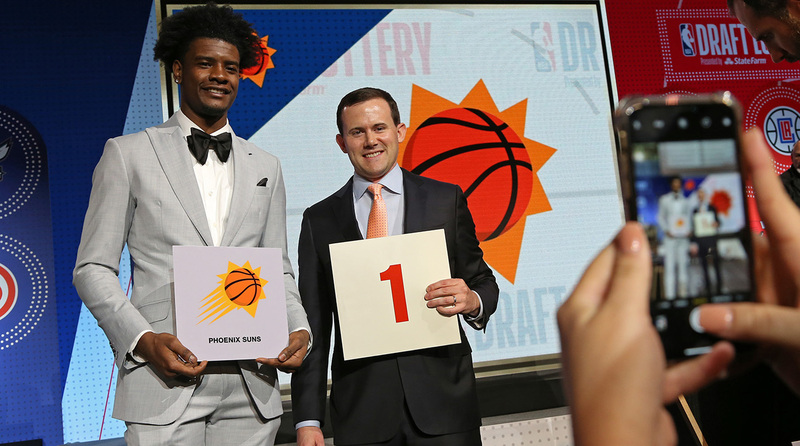 The 2018 NBA Draft lottery is in the books: The Suns claimed the top spot, the Kings jumped way up to No. 2, and the Hawks leapfrogged the Grizzlies and Mavericks to claim the No. 3 spot. Here’s the full lottery order for the Draft, which is set for June 21 at Brooklyn’s Barclays Center. Now that the picks are set, let’s examine the winners and losers from Tuesday night’s lottery drawing. This victory was a long time coming for Phoenix for two reasons. First, the Suns have never held the top overall pick during their 50-year franchise history. Second, the franchise has been mired in the pits, missing the playoffs every year since 2010. The post-Steve Nash Era has seen it all in the way of dysfunction: draft busts, locker-room drama, multiple coaching changes, awful trades, contract hold-outs, poor free-agency moves and aggressive tanking. Over the last three seasons, Phoenix lost 178 combined games, the most of any team in the league. Now: A rare moment of real hope. While the Suns have often selected high in the lottery in recent years, they have been slow and unsteady in developing their young players. They have flat missed (Alex Len, Kendall Marshall) and are still waiting on some projects (Dragan Bender, Marquese Chriss). Their assembled talent outside of Devin Booker is badly lacking. With longstanding holes at center and point guard to address, GM Ryan McDonough will be elated at his ability to add DeAndre Ayton or Luca Doncic. The former is an athletic center who went one-and-done at nearby Arizona, racking up conference awards. The latter is a do-it-all Slovenian playmaker, who played for the Suns’ new coach, Igor Kokoskov, at EuroBasket last fall. With such obvious ties to two top prospects, Phoenix should enjoy a nice bump in fan interest after a truly dreadful run. The tanking issue has been a hot-button topic for years, and the NBA is moving to adjust its lottery odds for next year’s draft to try to slow the race to the bottom. Unfortunately, 2018 was yet another example of purposeful losing being rewarded with the top pick. The Suns finished with the league’s worst record this season after firing their coach in the opening week, trading away Eric Bledsoe after multiple years of drama, and shutting down Booker in mid-March. This wasn’t Phoenix’s first attempt at gaming the system: their shameless resting of Bledsoe in 2016-17 set the stage for this year’s hard feelings between player and team. Phoenix shouldn’t really be blamed for its commitment to losing, especially now that it paid dividends. For Silver, who began sending anti-tanking warning memos this season, this should be a bitter pill: the incentives for bad teams to lose once again proved to be greater than the incentives to win. Boston won’t select in the 2018 lottery but they were tangential winners for two reasons. First, hindsight shined favorably on the timing of the Irving trade. After using recent Brooklyn picks on postseason standouts Jaylen Brown and Jayson Tatum, Boston elected to move the 2018 pick and didn’t get burned in the process. This isn’t just a matter of pride: Cleveland landing a top pick would have had direct implications on the arms race as the two franchises battle for conference supremacy. 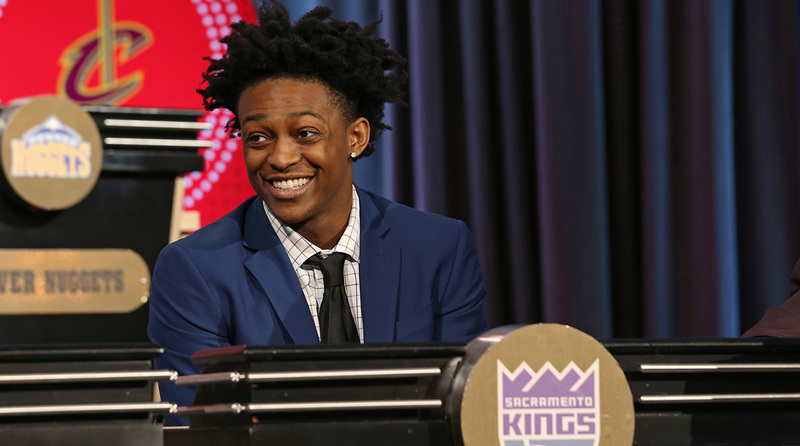 Second, due to the stipulations from multiple trades that were worked out Tuesday, the Celtics will now receive the Kings’ first-round pick in 2019 (top-one protected). Given that Sacramento will almost certainly be a lottery team again in the loaded West, Boston can plan on having its cake and eating it too. At this time next season, the Celtics could be playing in their third consecutive East finals plotting how to use a top-five selection. There’s a difference between second-guessing the Kyrie Irving trade and pointing out that it has largely backfired. By dealing Irving for Isaiah Thomas, Jae Crowder and Brooklyn’s first-round pick last summer, Altman pieced together a logical package, nabbing an Irving replacement, a 3-and-D wing and a potential top-five pick. Unfortunately, the on-paper version of that package didn’t materialize as anticipated, forcing Altman to ship out Thomas and Crowder at the trade deadline. That left the Nets pick, which was stuck in the middle of a hotly-contested tank race down the stretch. Brooklyn wound up winning 28 games with a rag-tag roster, enough to land eighth in the lottery order. Despite Nick Gilbert’s best efforts, Cleveland didn’t move up for once, thereby denying Altman an A-list trade chip this summer. With LeBron James’s free agency looming and stars like Kawhi Leonard and Paul George potentially looking for new homes, Altman could have been in position to dramatically retool the Cavaliers if the ping pong balls had broken in his favor. Alas, he’ll now have to proceed to Plan B. The lottery results are only a few hours old, and this is already shaping up to be a classic 1-2 debate. Ayton is a physical marvel who could theoretically punish teams that try to go small. Doncic is one of the most-hyped European prospects ever, a favorite of diehards who love his feel, scoring instincts and passing ability. Both players, as mentioned above, have ties to the Suns and both would be of real use to the Kings. In addition to the buzz around both players that’s sure to accumulate over the next five weeks, Ayton and Doncic would be entering situations without excessive pressure or expectations given their recent history. The downside of landing with the Suns or the Kings is that it will take a lot of hard work to transform those cultures. The potential upside, though, is being a Joel Embiid-like transformative presence in markets that desperately need a reason to cheer. Tuesday night wasn’t a surprising loss for the Pistons, but it was a loss all the same. Thanks to the Blake Griffin trade, Detroit had just a 2.5% chance of keeping their pick as it needed to land in the top three. Their Hail Mary didn’t come through, sending the pick to the Clippers and providing another reminder of Stan Van Gundy’s rough ending as coach and president. Despite taking on Griffin’s massive contract before the deadline, Detroit missed the playoffs for the eighth time in nine years and sacked Van Gundy earlier this month. His successor will have to pick up the pieces with a clogged cap sheet, a mediocre collection of talent and no lottery pick. Good luck. Sacramento made the biggest leap up the board, jumping from the sixth spot, which they shared with the Bulls, all the way to No. 2. Still reeling from the DeMarcus Cousins trade and a run of poor decisions by Vlade Divac, the Kings badly need the riches that Draft night could bring. They ranked bottom-three in both offense and defense last season after an off-season spending spree on the likes of George Hill, Zach Randolph and Vince Carter predictably failed to produce results. Much like the Suns, the Kings have been losing forever and still have little to show for it. Sacramento hasn’t made the playoffs since 2006, now the longest streak in the league, and yet it hasn’t cultivated a cohesive young core aside from 2017 lottery pick De’Aaron Fox. Ayton or Doncic would have plenty of opportunity to learn on the job immediately. Both Memphis and Dallas slipped in the lottery after turbulent seasons. The Grizzlies dropped from second to fourth, a fall that will likely take them out of the running for Doncic. This franchise desperately needed a new franchise player, given its ownership financial drama, Marc Gasol’s ongoing unhappiness, Mike Conley’s health, and Chandler Parsons’s albatross contract. Instead of possessing a clear path forward around a teenaged cornerstone, the Grizzlies might find themselves in a balancing act next season, developing their pick while also trying to remain competitive to appease their veterans. That will be a tricky dance for J.B. Bickerstaff, who secured his first full-time head coaching gig after commanding the tank as interim coach this season. The Mavericks, meanwhile, have been in a rut as Dirk Nowitzki plays out his twilight. With a hole at center and in the backcourt alongside 2017 lottery pick Dennis Smith Jr., their needs mirrored the Suns’ needs. Instead of getting to pick between Ayton and Doncic like Phoenix, though, they slipped to fifth in the draft order and will need to weigh the likes of Mohamed Bamba, Trae Young and Michael Porter Jr.